I had a nice little local chase this evening, without going very far at all from home. I had not really intended to chase, having a very busy day at work, and planning to work into the early evening. Through the late afternoon, I watched a cluster of storms develop SE of the St. Louis area, with several SVR warnings in Clinton Co., IL and points SE. A little before 6:00 p.m., I noticed that a very intense cell had popped up in St. Clair Co., just about 25 miles SSE of Edwardsville. It even had what looked like a hook echo on radar. Well, that was more than I could resist, so I got home, grabbed my stuff as quickly as I could, and was out the door by about 10 after 6. Immediately when I turned on the NWR I heard that the cell had been SVR warned within a minute or two of when I left my office. So I headed east on IL route 143 to route 4 and blasted south toward Lebanon. I managed to get on two severe storms, the first one being the storm that prompted the SVR warning for St. Clair Co. 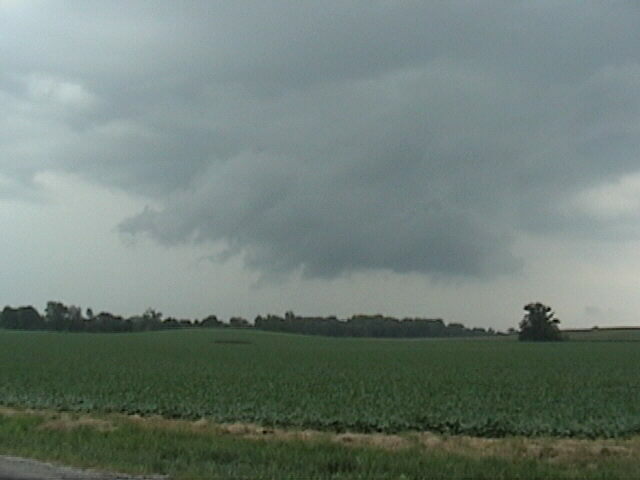 It had a large but non-rotating wall cloud which was located just east or southeast of Lebanon, IL. 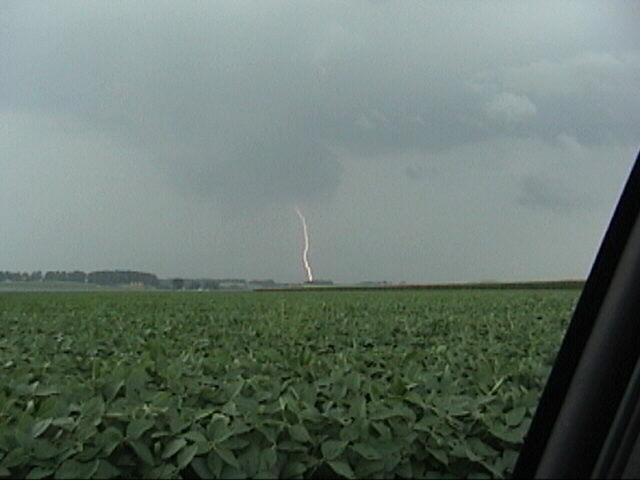 This lowering was directly under the main updraft of this storm. I watched this storm for about 15 minutes, until gradually the wall cloud became detached from the base of the parent storm cloud as the storm began to be seeded by another storm to its west over Belleville. So I broke off and cut south to get ahead of this storm, which also went SVR-warned at 6:45 p.m. I got in good view of this storm south and southwest of Mascoutah, IL, as it produced a roll cloud and later a lowering of some kind under the gust front southwest of Mascoutah. Both storms produced lots of CG, with the first one dropping nickle-sized hail and producing a 60 mph gust in Germantown and the second producing dime to half-dollar hail in much of the Belleville area into Fairview Heights. Got some decent structure pics and a couple nice vid caps of CG lightning, including this one of a CG bolt under the lowering on the front of the storm. Not a bad chase for not leaving until 6 and home by a few minutes after 8! Total chase distance: about 80 miles. Local storm reports from St. Louis NWS for July 22, 2004.